This field trip is optional and free. We will meet at the Java Spot (located in the WCC Student Center). This will give everyone a chance to get coffee or breakfast before the drive. We will leave WCC promplty at 9:00 am. Stragglers will be left behind forever. The drive will take about45 minutes. A private showing of experimental posters from the museum's permanent collection. The work of longtime Cranbrook faculty member Katherine McCoy as well as local hero Ed Fella are among the featured graphic designers. We will also check out the 2015 Graduate Degree Exhibition featuring MFA-level thesis work. We will leave for Detroit around 12:00pm. We will park in the John R. Street lot outside the DIA and have lunch at the DIA's Kresge Court. Please be prepared to pay between $15–$20 for food and drinks. We will walk through the DIA's permanent collection and decide as a group if we want to visit special exhibitions like Make a Joyful Noise: Renaissance Art and Music at Florence Cathedral (free), Rembrandt Guest of Honor (free) or the heavily publicized Diego Rivera and Frida Kahlo in Detroit ($14 admission). We'll walk back past the lot where we parked on our way to the CCS Alumni Exhibition. This will give people a chance to leave the group and head back to Ann Arbor by 5:00pm, otherwise, we'll spend about an hour at the CCS exhibition. If time permits we will visit the Museum of Contemporary Art Detroit (MoCAD) and Utrecht (an art supply store across the street). 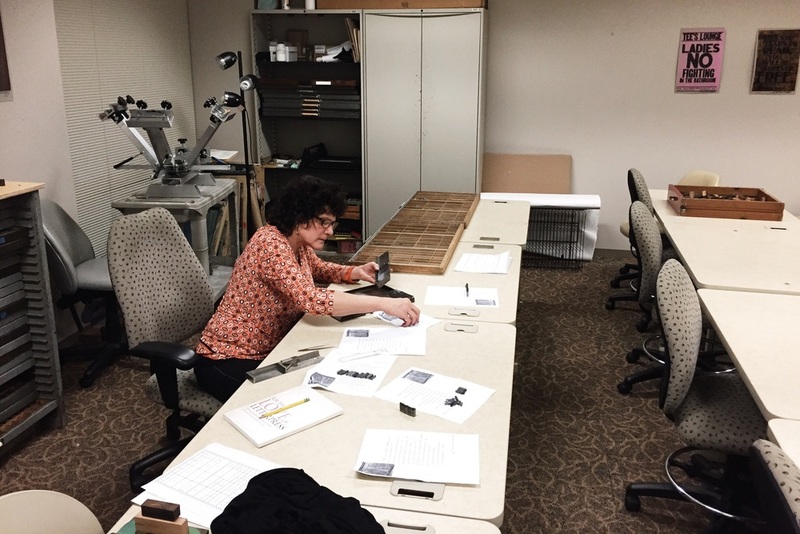 Here are a few shots from our recent letterpress workshop in GM017 of the Gunder Myron building. 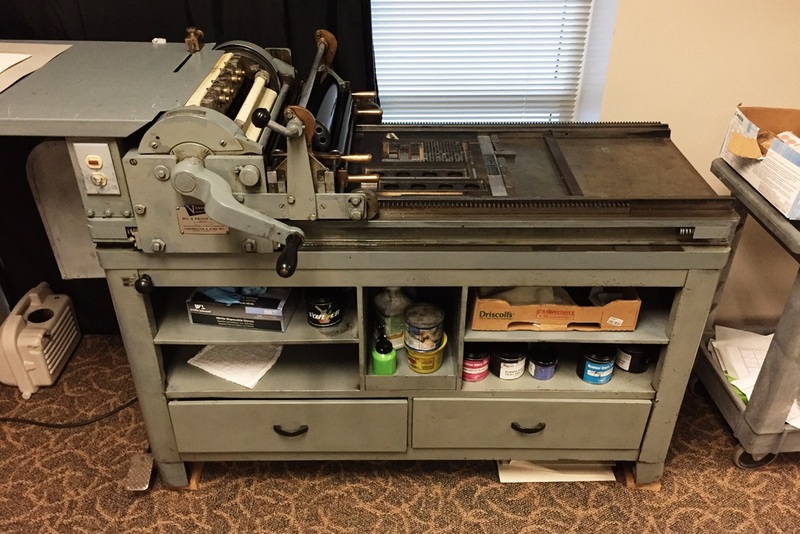 We've been talking about the Arrival of Printing in our History of Graphic Design class so it seemed like a good idea to spend an evening checking out Kristine’s equipment. This past Thursday a group of WCC students joined me in visiting a retrospective of Ed Fella’s work at CCS in Detroit. It was the first event in an optional day-long field trip I created to replace the typical last-day-of-the-semester activities for both of my current classes: History of Graphic Design (GDT-101) and InDesign Graphics (GDT-107). Ed’s retrospective dovetailed perfectly with our Postmodern lecture in the history class. Despite arriving later than planned, the trip went smoothly and included a nice long DIA visit, a quick MoCAD walk-through, a Utrecht supply run, and finally, a ridiculous dinner at Fatburger. The day in Detroit was time well-spent for everyone. Leaving the classroom is important for a number of reasons. First, it gives students a wider sense of the industry they’re pursuing. Graphic design instructors have a responsibility to expose students to the field as quickly as possible: the more they see, the better. This is particularly important at the Associates Degree level where field prep-time is condensed to 2-years. Second, the perspective shift helps to reenergize interest in the subject matter. It helps punctuate and galvanize classroom topics. Physical objects always reveal more about themselves than their on-screen counter-parts. It's easy to get a sense of Ed’s eclectic style by Googling some of his classic work, like the black-and-white posters he did for the Detroit Focus Gallery in the early 1980’s, but his camera-ready mechanicals tell a more complex story. Clearly, he found as much enjoyment in his working process as he did the end results, which must explain the endless hours of cutting, pasting, and assembling. The layers of paper highlight his organizational priorities, the mistakes he made (and maybe corrected), and also his deep familiarity with the reproduction process. Despite the random look of the final products, there’s not a single ill-considered pen stroke or paper scrap—even if it’s an accidental bit of random chance that Ed simply allowed to exist. This week, our graphic design history class watched a handful of short little clips related to the content of the course, but the main event was the The Visual Language of Herbert Matter, which we split into two viewing sessions. It's been a couple of years since I saw this film and forgot how good it is. Tonight I came across these photos I took during some class planning two years ago. I've used many different methods for plotting out semesters since starting at WCC close to three years ago. The hand-drawn infographic approach shown here is just one of those methods. I must've found it amusing, given the photographic documentation. Additionally, I've tried plain-text documents, Post-it notes, Google Calendar, Squarespace's events feature, cut strips of paper, and others that failed so fast they're no longer memorable.